In Mtwara Tanzania a SIDA funded program on Leading change; Civil Society Rights and Environment has been launched today. The launch was officiated by the Tunduru District Executive Director (represented by the Tunduru Environment officer Mr. Jonathan Albano Haule. In attendance were the WWF Staff who will be implementing the program, Partner CSOs (MJUMITA, MCDI, Tatedo, BMU representatives from Mtwara, Kilwa and Kibiti, Tuna Alliance and government representatives from the program priority areas of Mtwara, Lindi, Tunduru, Kilwa, Kibiti and Namtumbo. In his launching speech the guest of Honor expressed his gratitude to WWF for this program and specifically for choosing the Southern part of the country as a priority area for the program. He said although Tanzania is among the poorest countries but it is among the leading countries with natural resources at number four worldwide. He said if the existing natural resources are used sustainably it will be a sure way to combat poverty and improve people’s livelihoods. ‘Unfortunately our natural resources are being lost in an alarming speed! The National Forest Resources Monitoring and Assessment – NAFORMA shows that about 372,000 acres of forests are being destroyed every year! Likewise in the ocean it is reported that a blast is being reported after every 10 minutes, while past reports had showed that at least 10 elephants were being killed every day in 2013/2014. Of course these are a bit old data and possibly latest data would show improvements but still this is a situation that needs immediate controlling. The government will work hand in hand with the Community based organizations and WWF who will be the implementers of this program’ he said. 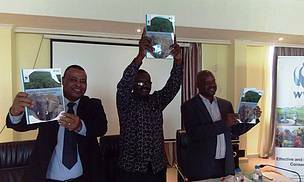 Dr. Amani Ngusaru the Country Director for WWF Tanzania Country Office in his remarks said, ‘this program aims at supporting the Tanzania government initiatives in conservation by leading change in conservation in the Ruvuma landscape. We are very confident that by the end of this program in 2022 People in the Ruvuma Landscape will be Effectively controlling decisions, Receiving full benefits from natural resources & exercise their rights for ensuring that the ecological integrity is sustainably managed, and they are Increasingly using sustainable, clean and affordable renewable energy. We want to see the capacity of CSOs and CBOs is improved and geared towards responsible and inclusive Natural Resource management and the use of renewable energies. In all these women and the youth with be at the centre of sustainable investments and participation in the decision making process’. The five year program which is supported by WWF Sweden and funded by SIDA will be overseen through Marine, Forest and Selous Ruvuma Landscape programmes under TCO and mostly implemented by partner CSOs and CBOs in the landscape. It will be in the areas of advocacy, Community Based Natural Resources Management, Research and Learning, capacity building and strengthening, strengthening policies, laws, regulations and enforcement and innovative business models. The program is also being implemented in Mozambique, Namibia, Kenya and Uganda.